Word to Vacationers: Go For It! When I sent out my Church Wellness Report this morning, I immediately received a slew of away-on-vacation auto-responders. All I can say is: Way to go! Take those vacations. Be kind to your family. Be kind to yourself. Work isn’t everything. I know that it took me a full week in Seattle before I relaxed enough just to sit on a deck and watch the ferries go back and forth. I love my work. I get to write freely, explore fresh ideas, help congregations, meet some extraordinary people, and walk through Manhattan. I’m just weeks away from a most exciting venture: launching a software-as-a-service application that will make a difference in people’s work lives. And yet when I sat on that Seattle deck, I didn’t think about work. I thought about my wife of 35 years, my wonderful sons and their wives, my extended family, and the simple joy of being alive. So, a word to the reader whose computer wrote me: “The family and I will be on vacation, out of the office and away from e-mail access.” I say: go for it. My words will be there when you get back. Your family needs you right now. 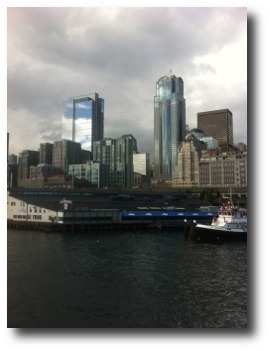 Photo: Downtown Seattle, from the Bainbridge Ferry.